The Karmeliter Viertel ("Carmelite Quarter") is the second district of Vienna, the Leopoldstadt, includes several of the rather few attractions of this part of Vienna. 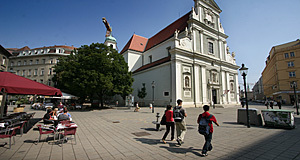 It is situated around a former Carmelite monastery. The monastery is not preserved today, but there are some remains of the walls that surrounded it and segregated the monks from the Jewish ghetto - which bordered to the monastery. The focal point of the area is the Carmelite Church and the square in front of it. It is a very nice corner of Vienna, with market stalls that sell fresh food, many small cafes and independent shops in the surroundings. The area is very popular with young people and immigrants. It is reasonably expensive and still very central, with excellent connections to the first district. The Karmeliterviertel also has a very high number of Eastern European Jews that have moved there in recent years. Therefore, you can find not only a memorial site where Vienna′s Jews were gathered for deportation during the Nazi days, but also lots of Kosher food stores and other Jewish institutions. In the northern border of the Karmeltierviertel, the Augarten, you even find a private Jewish school. In several corners, the neighbourhood has the atmosphere of a village. There are some cosmopolitan corners, too: In the fashionable office towers of some major corporations, or in the OPEC tower. The story of the Carmelites in Vienna started elsewhere, though - they were called to Vienna by the Habsburg Rudolf the Founder ("der Stifter") in 1360. Here they built the Kirche am Hof, but in the course of the reformation, the Carmelites left Vienna and this church was given to the Jesuits. The Carmelites did not return until 1620, when they were given extensive stretches of land in today′s Leopoldstadt. By 1639, they had built their monastery, church and some minor buildings. The shiny new monastery was looted and burnt to the grounds by the plundering Turkish troops in the course of the second siege of Vienna in 1683. Once the church and monastery had been rebuilt, it was equipped with a trinity column as a sign of victory (or at least survival). The exposed position of the monastery - facing the first district - made it a battle site again in the course of the Napoleonic Wars. Further damages were caused by floods (in 1830) and the revolution (of 1848). By 1901, the battered monks were fed up with the Leopoldstadt and moved to Döbling, a much more peaceful district. The old monastery (or what had been left of it) was demolished and the church became a parish church. In retrospect, the Carmelites have made a smart move - the church was badly damaged by the bombs of WWII (like most of the second district). It was re-furbished after the war and opened only in 1961. Attractions nearby include the Urania on the other side of the Danube canal; the Augarten and the two Palais in it; the park area of the Prater; the Riesenrad Ferris wheel and Vienna′s biggest football stadium.